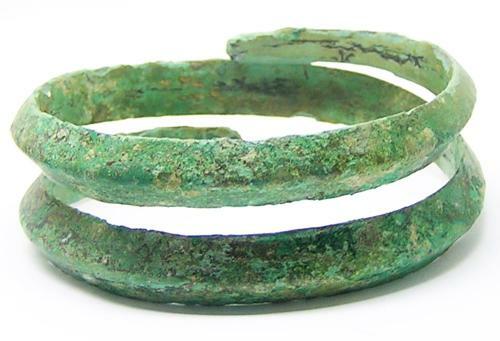 This is an ancient bronze coiled bracelet, dating to the 8th - 6th century B.C. It is of a shape popular from the late Bronze Age and Iron Age in Europe, belonging to the Hallstatt culture. Such a bracelet was worn on the upper arm. This example is intact with a nice ocean green patina. Hallstatt culture developed from the earlier Urnfield culture, and would progress into the later La Tene culture, which is often called Celtic. However, these names and classifications have been imposed upon ancient peoples by archaeologists and historians (Hallstatt, for example, takes its name from the type site, which is located in Austria southeast of Salzburg). 2700 years ago, these people lived in small groups, probably loosely confederated for trading purposes but engaging in frequent warfare. DATE: c. 800 - 600 B.C. PROVENANCE: Ex. European Private Collection, Munich, Germany.